Syria's Chemical Weapons: Is Disarmament Possible? Home » Perspectives Papers » Syria’s Chemical Weapons: Is Disarmament Possible? Syria’s Chemical Weapons: Is Disarmament Possible? EXECUTIVE SUMMARY: Implementing chemical disarmament in Syria will be an enormous challenge, and the prospects for accomplishing it are doubtful. 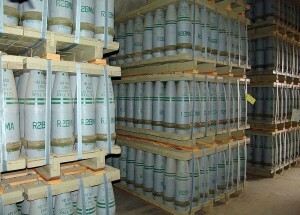 Appreciable portions of the chemical weapons arsenal have been trans-located, in part untraceably. Moreover, the timetable for Syrian disarmament announced by the US and Russia seems too condensed, even if “good will” and “fair play” are (mistakenly) assumed. Syria possesses a huge chemical warfare alignment, with dozens of multiform facilities and installations. Just an up-to-date mapping of this alignment is a very complex mission. The plausible possibility that various Iraqi chemical and biological weapons were added to the Syrian CBW inventory significantly complicates the situation. Moreover, Syria is likely to methodically further develop biological weapons as a powerful alternative to chemical weapons; and the US-Russia accord does not deal with this. This special edition Perspectives Paper can be viewed in its entirety in this PDF link. It constitutes an update and expansion of the author’s previous seminal articles on this topic, including Chemical and Biological Weapons in the Arab Countries and Iran – An Existential Threat to Israel? (Hebrew, Begin-Sadat Center for Strategic Studies in Hebrew, 1999), and Guile, Gas and Germs: Syria’s Ultimate Weapons and Poisoned Missiles: Syria’s Doomsday Deterrent (Middle East Quarterly, 2002). While various events and assessments related to the Syrian chemical weapons (CW) capabilities and conducts have been largely covered in the media since the civil war began, the picture concerning the program’s evolution – both conceptual and technological, which led to Syria’s vast CW arsenal – have remained nearly unnoticed. Comprehending the evolution of the chemical program is a prime tool for coping with the current complex situation, particularly since Syria is about to join the international CW convention. Above all, hovers the question of whether President Bashar al-Assad is indeed ready to give up Syria’s non-conventional arms. This essay addresses these issues and provides a detailed picture about the Syrian CW program, from its inception to the present. Syria today is a prominent member of the chemical and biological weapons (CBW) club. As early as 1992, the US Defense Department ranked Syria as the sole Muslim state possessing a “chemical systems capability in all critical elements” for chemical weapons. And in recent years, Syria has added biological weapons to its arsenal. Money is also there, and in plenty; the picture of poverty that is drawn for the Syrian army’s conventional ordnance is misleading. Syria spends between $1 billion and $2 billion annually on its ballistic and CBW capabilities, an enormous share of its military budget. Syria’s successful development of its CBW capabilities is a textbook case of how a small but determined state can operate beneath the radar of international scrutiny, building a formidable array of non-conventional capabilities under an ostensibly scientific cover. Yet media reports and most discussions of Syrian CBW programs have been far from adequate. What strategic concepts inform Syria’s programs? And what is the nature and composition of the Syrian CBW alignment? A thorough analysis of those questions would clarify some aspects of Syria’s chemical arsenal. Will Syria’s Chemical Weapons Arsenal Be Eliminated?